Why did we use such a poor tripod? Matt was planning to bring a proper one, but at the last minute decided to downsize his luggage by taking one small enough to fit into a smaller bag — in fact, it’s the tripod that came free with a telescope he recently bought. Not a good move: it was too short for many of the shots we wanted to take, too flimsy to properly stabilise the camera in many situations, and didn’t have enough degrees of freedom to let us get every shot we wanted from the best position. Still, it was better than nothing, and we did contrive to get all the specimen photos we needed. Matt deliberately left behind his tripod — it’s on the desk where we had the pelvic elements. He has much better tripods at home, and regrets the false economy of bringing that lighter and less stable one. But we figured it would be better than nothing for the use of anyone who turns up in collections with no tripod at all, so please feel free to make it available to visitors. Matt asks only that it be known as “The Mathew J. Wedel Memorial Tripod”. Thanks so much for the tripod – I KNOW it will come in handy! Ah, sorry about this but my client insists that it must be known by its full title The Mathew J. Wedel Memorial Tripod at all times. If necessary, you may abbreviate it to TMJWMT on second and subsequent mentions. I can engrave it in the Lab and apply a B72/India Ink/B72 sandwich acronym/monogram on it. I will also construct an archival museum mount for it and put a security chip in its brain. Oh, and be sure that when the tripod is not in use it is stored in an airtight positive pressure chamber full of an inert gas. It should also be polished twice daily with the down of a hatchling bald eagle (fresh down each time, naturally). Finally, the tripod itself should be listed as an author on any publications that include photos taken with it. Please send a runner to my office in California to confirm that these instructions will be carried out to the letter. The runner hasn’t arrived yet (to my knowledge) but I think we can take it as read that Carl will comply with these very reasonable conditions. So, folks! 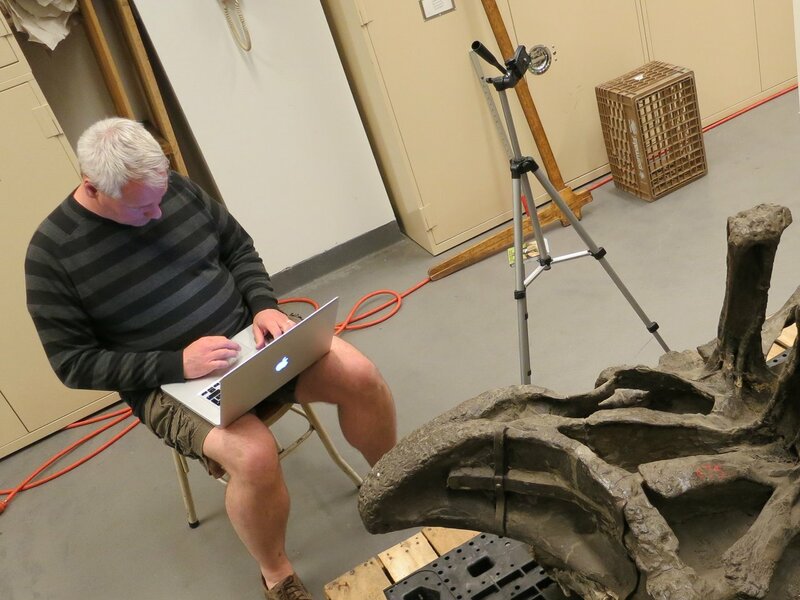 If ever you’re working in the AMNH big-bone room, and you find you’ve forgotten your tripod … you might just be lucky enough to be allowed use of the Mathew J. Wedel Memorial Tripod! And of course Mathew J. Wedel owns all copyright to any images taken of the tripod. I presume that to be correctly named “The Mathew J. Wedel Memorial Tripod”, Matt has made arrangements for his passing – hopefully something fitting such as being crushed by a falling Brachiosaurus dorsal. Mike, if you’re going to be there at the time, could you please take some photos, preferably with a proper tripod? Alternatively, it could be named “The Mathew J. Wedel Visit Memorial Tripod” and thus avoid the possibility of damaging any sauropod vertebrae. Mook, C.C., 1917. Criteria for the determination of species in the Sauropoda, with description of a new species of Apatosaurus. Bulletin of the American Museum of Natural History 38, 355-360. Osborn, H.F., 1904. Manus, sacrum, and caudals of Sauropoda. Bulletin of the American Museum of Natural History 20, 181-190. No, we’re just planning ahead. Excellent work, Steve P — it is indeed “Apatosaurus” minimus AMNH 675. McIntosh, John S. 1990a. “Sauropoda.” In The Dinosauria, 345–401. Berkeley and Los Angeles: University of California Press. McIntosh, John S. 1990b. “Species Determination in Sauropod Dinosaurs with Tentative Suggestions for the Their Classification.” In Dinosaur Systematics: Approaches and Perspectives, 53–69. Cambridge: Cambridge University Press. Upchurch, Paul, Paul M Barrett, and Peter Dodson. 2004. “Sauropoda.” In The Dinosauria, 2nd Edition, 259–322. Berkeley and Los Angeles: University of California Press. But what actually is it? Well, at the moment, no-one knows. If you conclude that it definitely can’t be assigned to any named genus, does it get to be Brontosaurus again?